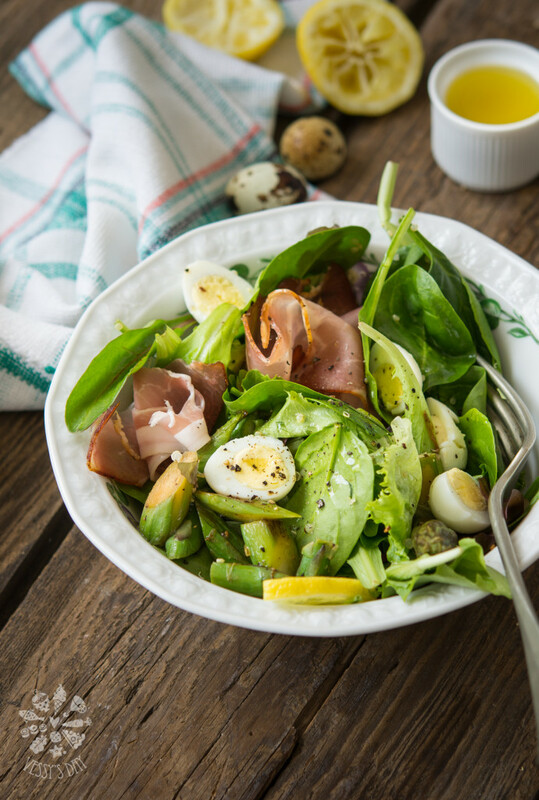 My recipe for this beautiful salad is just what’s needed on a hot summer day. It is absolutely delicious and so nutritious that you will not need any additional meals, just a glass of white wine (I would strongly suggest). 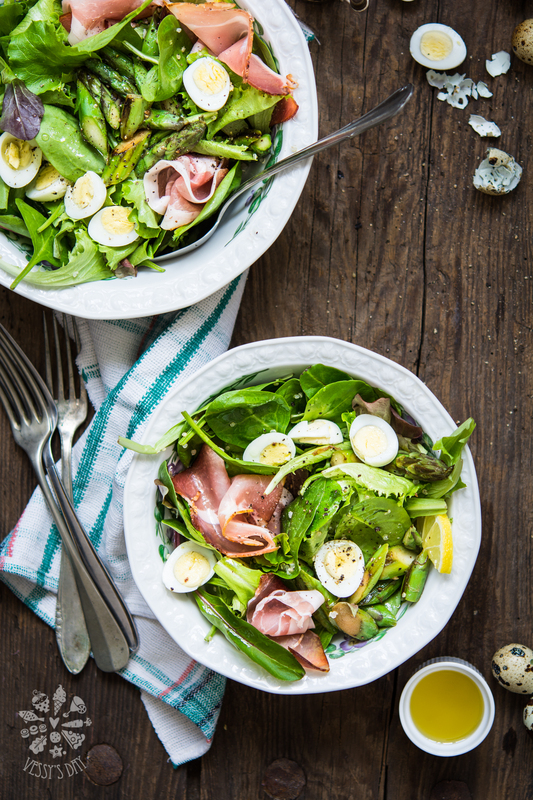 This salad, like many others, is totally adjustable to your taste and what’s in your fridge. You don’t need to run to the store for quail eggs if you don’t have on hands, just use regular eggs. You can easily add other salami, instead of prosciutto; use buckwheat, bulgur or cous-cous instead of quinoa; add some raw nuts for extra nutrition and power; skip the asparagus if not in season or add grilled zucchini or eggplant. Do it as you like it. At this point it may seem like a lot of work, but trust me, this salad is delicious and worth the time. Out here in Bulgaria, we have this traditional salad called “shopska salad”, made of chopped cucumbers, tomatoes, green onions and feta cheese, seasoned with olive oil, vinaigrette, salt and pepper. That’s probably the most popular salad around here. 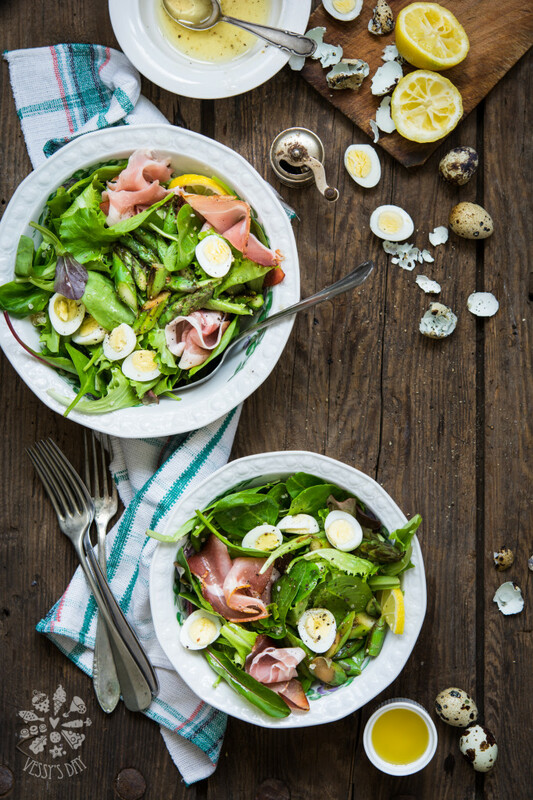 This salad is on family tables almost every day, all year long. It’s classic and we love it. 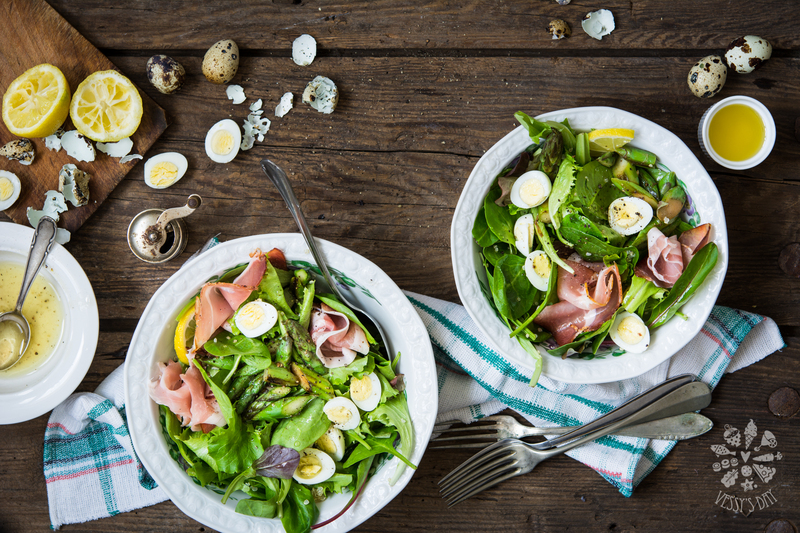 When I was living in the states, back in the day, the most popular salad, that almost everyone around me had, was the Caesar salad with ready made dressing. Feel free to correct me, don’t want to sound like an expert here. I remember us having a lot of romaine lettuce salad with all kinds of commercial dressings, too. This is ok I guess, cause you can have a salad on the table in no time, but around here we rarely use commercial dressings, even if you want to buy one from the store, you may not even find any, except in the big supermarkets. So, back to salads. I have to say that people eat a lot of salads around here. There are so many types. Sometimes, on a restaurant menu, salads’ list is longer than the main courses’ list.Often many people end up having a salad as a main course. 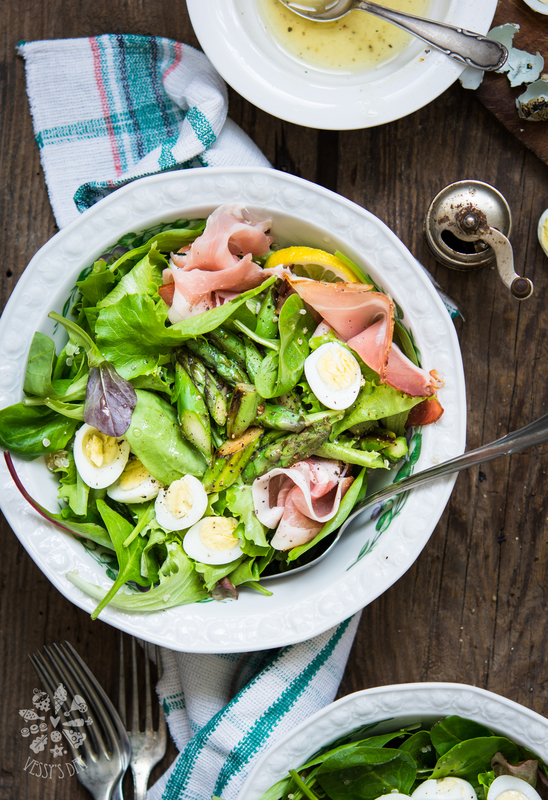 But the salads I am talking about are very rich – they have vegetables, meat, some kind of pasta, quinoa, bulgur, raw nuts, eggs, fish and etc. 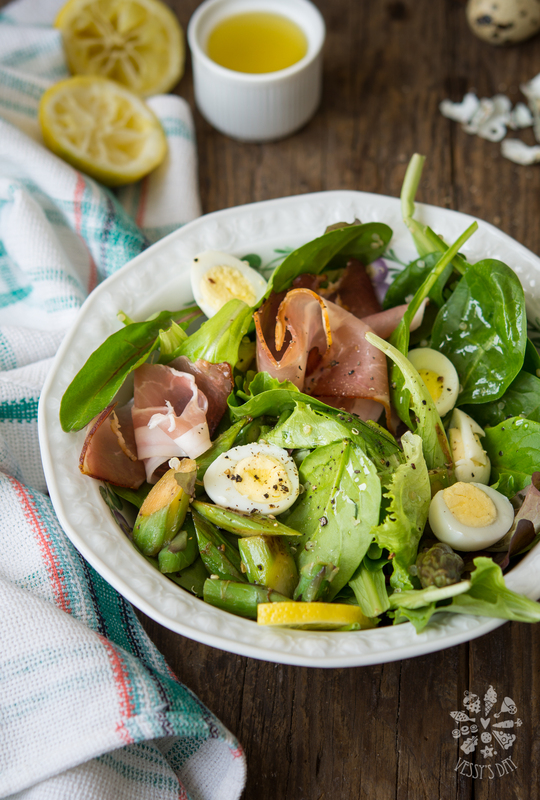 During the hot months of the year, we often prepare a big bowl of salad and enjoy it with a glass of white wine. By the time for main course we are already full and end up having a light meal, after all. That’s what I am talking about. Summer is all about fresh ingredients, staying as cool as possible, avoiding greasy food and just enjoy a healthier time of year. To cook quinoa, in a small casserole bring a little bit of water to the boil. Add quinoa and cook for 5 minutes then drain and rinse with cold water. Set aside. *You can easily cook few additional tablespoons of quinoa and keep in the fridge, covered. You can keep quinoa in the fridge up to a week so this way you will have cooked quinoa for salad recipes whole week long. Cut asparagus into small pieces and cook in a little bit of olive oil for about 2 minutes, stirring to cook over all sides. 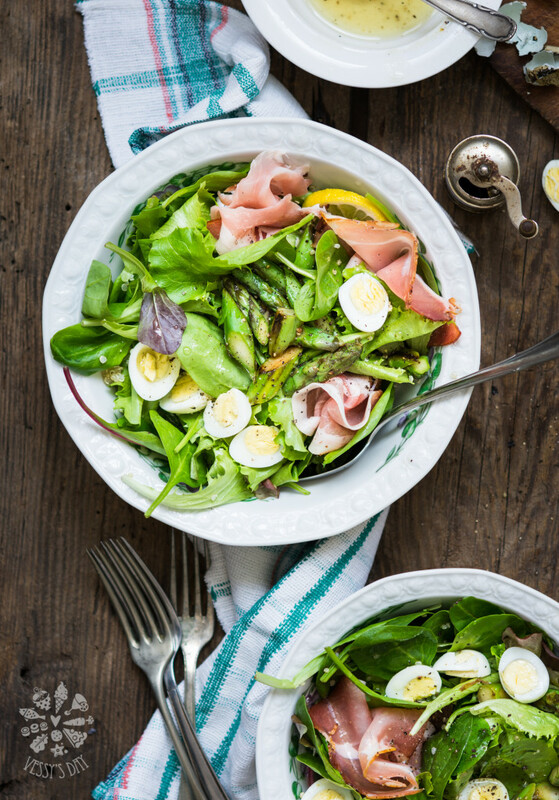 In a large bowl add green leafs, baby spinach, a couple of tablespoons of quinoa, asparagus and eggs. In a small bowl combine ingredients for the dressing then pour over the salad. Give it a good stir, arrange prosciutto slices over and serve immediately.